Fairy tales are often pretty violent--it’s an aspect that gets glossed over, but so many of those stories involve monsters preying on young kids. They sort of naturally lend themselves to horror movies, and indeed a handful of films have used them to great effect (Wes Craven’s New Nightmare makes especially good use of "Hansel and Gretel"). Little Erin Merryweather takes the familiar tale of “Little Red Riding Hood“ and infuses it with a slasher aesthetic to mixed results. After a college student is brutally murdered right off campus, Peter Bloom and his investigative friends decide to look into the case. 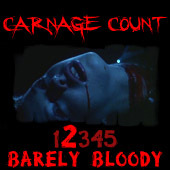 As the body count increases, they also seek help from a psychology professor to figure out who the killer is. Unbeknownst to all of them, the killer is operating right under their nose; a victim of childhood trauma, this killer begins targeting Peter and his friends. Little Erin Merryweather is a film that really can’t decide what it wants to be. We find out fairly early who the killer is, so this is one of those movies where we’re waiting for the characters to catch on and wise up. For the most part, it’s a straightforward hack-em-up that has a few slash and stalk sequences. There’s far more stalking than slashing though, as this isn’t a particularly grisly film. In fact, it’s obviously taking a cue from Carpenter’s Halloween in that it wants to be moody and violent without being overtly bloody. I say this because there are numerous nods to Carpenter’s film, from the names of one of the characters to the film’s climax, which borrows many of the beats from Halloween. Plus, so parts of the film are soaked in deep, ethereal blue lighting that reminded me of Cundey’s cinematography. If anything, they picked a good film to emulate. That emulation translates into a moderately interesting experience, mostly due to the fairy tale aspects. The brief, fleeting images of the killer’s vivid red attire in the snowbound woods are pretty striking, and the film actually manages to be quite atmospheric and moody for the first fifteen minutes or so; this is when you still think it’s going to be a mystery. Instead, the cat gets let out of the bag far too soon, and the most interesting elements are dropped, like the flashbacks to the killer’s childhood and the child’s voiceover, once-upon-a-time narration. Had the film found some way to merge the present day murder mystery with the flashbacks and fairy tale elements, it could have been quite strong. As it is, it’s just a sort of decently made independent production that admittedly shows a lot of polish. The characters are fairly bland, though our killer kind of stands out. Sure, it’s the usual childhood trauma stuff, but the film tries to do some interesting things with the killer’s M.O., which involves hollowing out the victims’ bodies and filling them with stones. When they’re not spouting 101-level psycho-babble, everyone else is basically there to fill up the body count, which isn’t that hight. You start to wonder who exactly this film was made for because it won’t satisfy most slasher fans, and it’s certainly not much of a murder mystery either. It’s just another in a long line of well-intentioned films that have some interesting ideas that don’t quite make it all the way to the screen. We’ve seen plenty of films like this, and this one does give a legitimate effort with the fairy tale stuff. Indican Pictures released the film on DVD about 4 years ago--it’s got an anamorphic widescreen transfer, 5.1 audio, and some special features in the form of a couple of trailers, a still gallery, and previews of other Indican offerings. It’s available from Netflix too, which is your best bet; this one isn’t much of a big, bad wolf, but you won’t mind strolling through the woods with it once. Rent it!